A month ago, we asked for a blood gas to be taken, as I hadn't had one done for 6 weeks and I had been having some terrible headaches. We found the CO2 levels to be high (9.2 kPa) which probably caused the headaches! So my parents and I started questioning whether the Optiflow had been used in the right way. After a week of trying to get to the bottom of this, my parents had a meeting with the Intensive Care consultant which resulted in changing the Optiflow settings to higher flows and lower oxygen concentration to help wash out the CO2. That was on the 28th November, after a very frustrating and tiring week! Generally my CO2 levels have not come down much but my oxygen concentration setting has been weaned down from the high 50's to 35%. We also discovered that having a few hours off the Optiflow has resulted in lower CO2 blood level readings. So, I want to get off the Optiflow completely. I've been on and off a number of antibiotics as usual, including one called Tigecycline. I have been on this in the past, and it is a drug that causes me to be very nauseous. But this time, it not only made me nauseous, it also made me have low blood sugars, high blood pressure and it made me lose weight! Also, when I looked at the side effect profile online, it was stated that one of the common side effects was 'death'!! So I decided I didn't want to be on that drug anymore, and switched to another antibiotic - which also made me feel sick! I've also started more anti-sickness drugs; I have been on aprepitant, cyclizine and ondansetron all to combat my nausea. 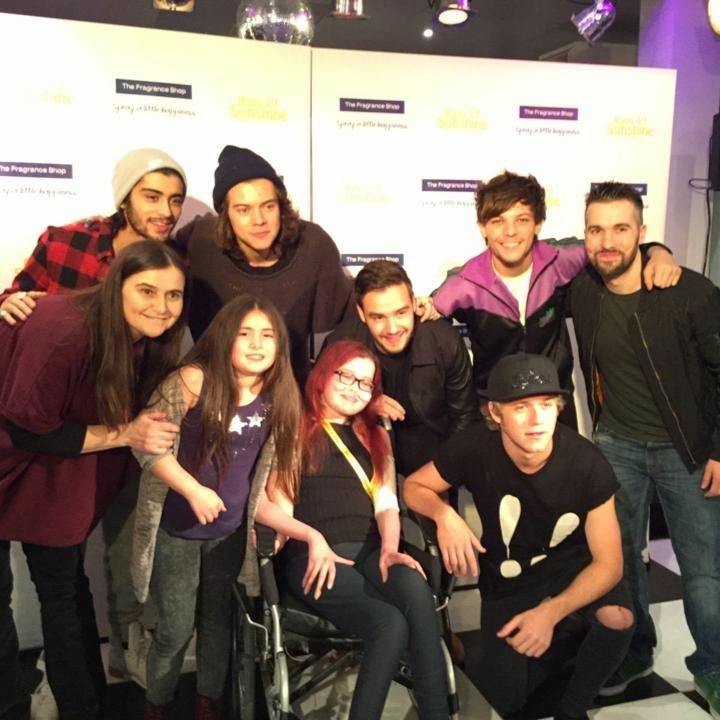 On the 9th December, I travelled by private ambulance to London to meet One Direction for my wish with Rays of Sunshine Children's Charity! It was such an amazing day that I will never forget! We got up in the morning and I travelled in an ambulance with my dad, my nurse Carrie (who has looked after me a lot this year and last year), and two paramedics, Sue and Steve. My mum and sister, Imogen, travelled to London in our car. In the ambulance on the way there, I was so excited and nervous! Carrie was playing lots of One Direction songs on her phone all the way there! At one point I was worried we were going to be late, but we got there eventually! The meet up was at Elstree Studios. We were led into the building by the Rays of Sunshine volunteers who were all really lovely, and I met my wish co-ordinator! The room was decorated brilliantly - it looked so magical! A lady dressed as Elsa from Frozen greeted us as we came in, and there were people doing the hair and make up. We shared a table at the very front with another family. There was an added surprise - we met some of the boys from Stereo Kicks, who were on the X Factor. I didn't get to talk to most of them, but Jake Sims (my favourite ;-)) was really nice, and spent time chatting to me and asking who my favourite from One Direction is! After that, it was finally time for the 1D boys to arrive! They came into the room and they were sitting so close to me - Harry was literally a few feet away! When he first came in, he said hello to me straight away - and he nearly fell on top of me! Haha! We had all written questions for the boys down, and we had the chance to ask them a question each. They are so down to earth. A little boy went up and sung with them too! Now it was time to meet them! Harry came over to our table before the photos. He hugged me and was chatting to me and asked if I liked the burgers, to which I said 'I don't know, I'm vegetarian...' And he said I could eat the bit of lettuce in the bun with it ;-)! I went up to get a photo with all the boys and spoke to them all. Liam said he loved my shoes. Harry pushed me in my wheelchair back to my table, but he had to push me back because then we had a photo with all my family with the boys too! And another photo with me, the boys, Carrie and the ambulance crew! I think they were pretty chuffed they got a photo too! All of the wish families got a photo with boys and the chance to chat to them too. It was lovely to see the smiles on all of these brave children's faces - having a great day that they'll remember forever, and just having a few hours to forget about the worries and stress that their daily lives hold. Rays of Sunshine is a really good charity, and they really made sure everyone had a special day! It was time to say goodbye now, I wanted to stay longer! Everyone got a signed t-shirt, a bottle of One Direction's new perfume 'You & I' and two tickets to their On the Road Again Tour next year! I am so grateful to everyone that helped make the day special for me - Sarah (the ward sister), Debs (the ward clerk), Carrie, Sue and Steve (the ambulance crew), my lovely mum and dad (ooh, and my sister Imi too! ), the brilliant staff at Rays of Sunshine, and of course the One Direction boys! I gave the boys management a drawing to give to Harry, along with a message asking to follow me on Twitter, and a link to my blog, but I'm not sure they've got to him :-(! I'd really appreciate if you could please tweet @Harry_Styles to follow me @idkharriet_ if you have an account on Twitter! :-) Thank you! You may have seen the article about the event in The Mirror, the Metro and The Daily Mail online :-)! It was weird seeing my photos all over Twitter too (with some people cropping me out - cheeky!!;-)). This year I had two AMAZING advent calendars! I don't really like normal chocolate advent calendars, so this year I got some beauty ones! Each day leading up to Christmas you get a beauty product! I had a Boots No7 one and a Tesco Beauty one. I've got a lot of make up and perfume now! Yesterday was a bit crazy! For a while now, my heart rate has been quite high, but yesterday morning whilst I was still asleep, my heart rate went up to 160 bpm! I woke and it went to 170 bpm, I coughed and my heart rate then went up to 190 bpm! I felt sick so I had my cyclizine which normally pushes my heart rate up a little bit anyway, and it went to 200 bpm! And at one point when I coughed it went to 230 bpm! This went on for about 3 hours. I had an ECG done, and then the cardiologist registrar came up and did another ECG. He found irregularities in my heart beat. A strange thing happened then - when the cardiologist was still here, I had a forceful cough and suddenly my heart rate dropped by 30 down to 150. The registrar went away and discussed this with the consultant and reviewed some of my drugs. Two of the drugs (Aprepitant and clarithromycin) are known to cause heart issues, so these two have now been stopped. The whole situation about Manchester is pretty frustrating! They still aren't trained on the Optiflow up there, and they are telling us they have no beds available right now, so for now we are stuck in Bristol. Hopefully we will soon be able to go home, as I think it would benefit us all being out of hospital in our new house, where we can have a nice fresh start and hopefully build up my strength and get me well and fit again! It will also be nice for me to get into my school work as I have missed a lot of school, and for my sister to start her new school. I hope this new year will be a better one, and that I can get better! I would love to be off oxygen and get walking again. Early last year we bought tickets to see One Direction in April 2015 in Dubai and I really really would love to be strong enough then to be able to go on an aeroplane and see them there - it would be amazing! I'm determined to make it happen one way or another :-)! Please pray that I will be fit for then! I hope that everyone has a brilliant year this year. Remember those who aren't here today, be thankful for all God has blessed you with, and pray that you will have the strength to overcome any obstacles in your way. 2015 is going to be a good year! I have designed some CF Warrior t-shirts, and I will set up a page to order them on this week, so if you'd like to order one, check back soon! I will be selling them for £16.00 each, with £2.00 postage and packing for the UK. I can also ship worldwide, but obviously p&p will be more expensive. Some of the money I make on my t-shirts will towards making 'hospital packs'. I've had this idea for a while. 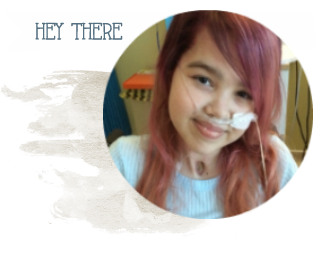 My idea is to make little 'packs' with presents for people spending time in hospital. The boxes will be personal, with little gifts to make the hospital experience a little more bearable! If anyone knows of any businesses that you think would donate items to put in boxes, or if you would like to make something to put in the boxes, it would be great if you could contact me :-)! There are outstanding meeting rooms available in locations all over the world, to suit a variety of different budgets. Choosing the right meeting rooms could make the difference between success and failure, so it's well worth carrying out plenty of research to ensure you choose and appropriate place. Girl you are so beautiful! And amazing! And strong! My name is Renee and I would love to get to know you more if you want!! On Instagram I am jesus_girl_4_life and on Facebook I am Renee Kauffman. God bless! !